The moment you have all known was coming is now here! My first food post from NYC!! I have a whole lot to share. Not as many photos as I would wish but it is only because it has all been so good I cannot slow down long enough to snap a shot...get in my...you know. Where to begin?! Breakfast I guess. We have had breakfast out twice so far. And I cannot decide if I have a favorite of the two. I don’t think I can have a favorite. I just cannot do it! Our first breakfast stop was Clinton Street Baking Company (CSBC). Oh my goodness. I don’t think I can say that Aretha Frankenstein's pancakes in Chattanooga are my favorite anymore. They are certainly my favorite in the South. Well, Pancake Pantry in Nashville is pretty amazing too. Ok, sorry. CSBC's pancakes are so sweet and melt in your mouth they don’t even need syrup. 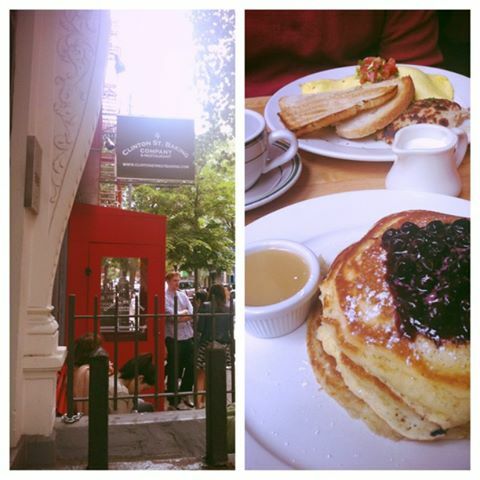 I had their blueberry pancakes and oh my word. I just can’t even describe how good they were. The hubs had a delectable omelette with chorizo and it was oh so stinking good. You can taste the freshness of the ingredients in everything they serve. I usually can’t do orange juice due to the all the acid but CSBC’s fresh squeezed orange juice was absolutely amazing. I don’t know where they get their oranges but I need some of them. And then I need to plant a tree in my yard. The cafe is very quaint and cozy. It only adds to the excitement. There may be a wait and they may tell you more than an hour but stick around because not everyone does. It is so worth it. Another quaint spot we have found is Petite Abeille. This little Belgian place is quite a gem. They have more than one location too so that helps if you are ever in the city. They also serves what sounds like some awesome dinner and the hubs said the Belgian beer selection was quite splendid. “I think we must go back for dinner,” he said. Their waffles are, of course, to die for. The waffle we shared was covered in fruit and surrounded by a mote of fresh strawberry sauce. Oh. My. It was so so good. Their yummy syrup wasn't even needed with that fresh sauce and whipped cream. I tried their bacon, mushroom and onion omelette and it was oh so divine. It is served with the best oniony, garlicy mashed potatoes. Such a great find. Both of these places are in Greenwich Village. We still had not had a NYC bagel as of yesterday so we stopped in at Murray’s Bagels in the Village. So fun and such a classic experience. Long line, order quickly, hope for a table and get out! The variety of cream cheese was overwhelming. The bagels were awesome. I had Cal’s Club on a whole wheat everything bagel. This club is homemade chicken salad with lettuce, tomato and bacon. It was huge!! I could barely eat half of it! The hubs had a classic Scottish Salmon bagel. It had Scottish Salmon, capers, red onion and a solid helping of cream cheese. It was also large and very yummy. That is a must stop for any time of day. They close just before dinner so don’t wait all day. 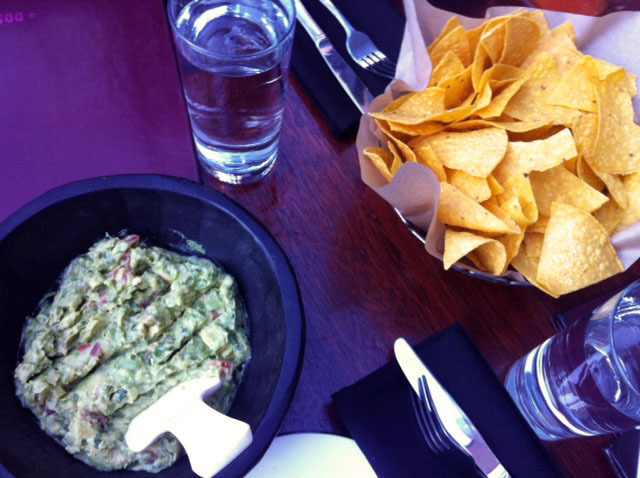 My craving for Mexican food was finally satisfied with a trip to Dos Caminos this weekend. Their menu is a little steep compared to what we are used to at home but it was quite tasty. They make super fresh and yummy guacamole and they have a trio of salsas for any palate. The Asada tacos were amazing and their mushroom and shrimp quesadilla was equally stunning. Their margaritas aren’t terrible either. If you are looking for sweet the blueberry/pomegranate was tart and tasty. As for pizza, we have enjoy Arturo’s brick oven pizza in the Village. Their caesar salad is also so so good. The atmosphere is perfect. The tables are close, the room is dimly lit, there is interesting art on the walls, the piano can hardly be heard over the chatter and the waiters are friendly but brief. Cafe Henri is a quiet little French cafe with a long list of crepes and incredible coq au vin chicken. This place feels like a true neighborhood stop. We felt certain that we were the only first-time patrons. That is always a fun experience in a big city. There are sweets on every corner in this city. We have had some delicious gelato at L’Arte del Gelato. The marscapone and nutella are an easy must have. I don’t feel like I really have to tell anyone in their right mind that you have to get those two. I mean, duh. Pasticceria Rocco. Oh my. Their cookies are the size of your face and they don’t stop with cookies. Cheesecake, danish, cakes...it goes on. I got a fruit-filled shortbread cookie that was amazing. A must for sure. A trip to Little Italy will secure a cannoli on every corner. 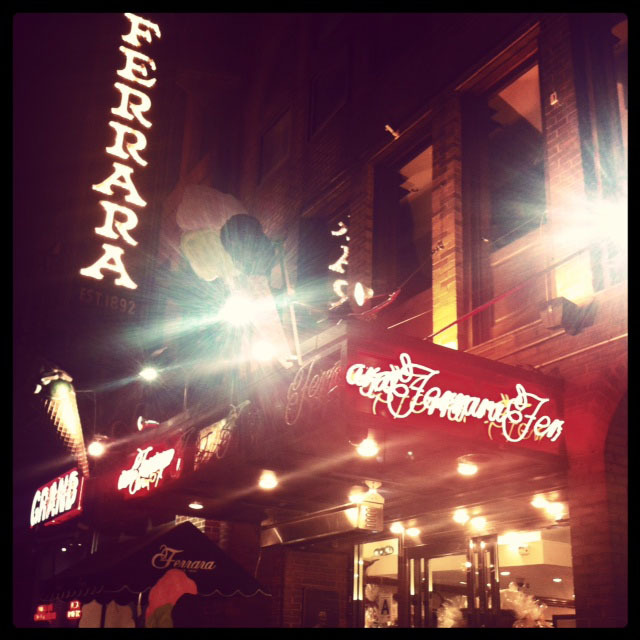 I have heard Ferrara is the place to go. We stopped by but were so full from dinner a tiny cookie was all we could manage. We will be back though. Oh, and I am told Stumptown coffee is the place for a perfect cup of Joe. Their new location in the village will brew your joe any way you want it at their fancy new brew bar. The hubs needed his fix this weekend and we ran into Mario Batali! You know it must be good right? Check back if you are looking for more foodie insite. I highly doubt this will be my last Tasty Tuesday NYC post.